John Connor though (no not the guy from Terminator) was looking for a way to rehabilitate himself after suffering a stroke – and decided that tackling a bike build would be the best way to help him get back to fitness. “I had a stroke and had to get back using my brain so thought, what better than to try and build a bike,” he said. 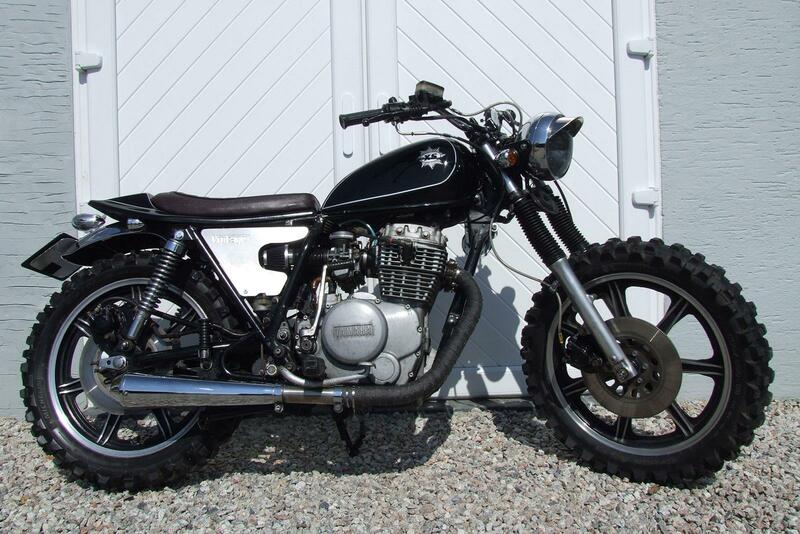 Cue his search for a canvas, he ended up finding a Yamaha XS250 that would give him a great base bike without necessarily having to do too much to the motor. “I was looking for a low mileage specimen and found this example which had 11,000 miles on the clock and was as tight as a nut,” he told us. The bike was a 1978 model but is fitted with the tank from a Suzuki GN125, which has been cut to fit the Yamaha’s frame. The seat was hand fabricated and the alloy sidepanels have been engraved. Announcing the bike's arrival are a pair of megaphone pipes and a cut frame help give the bike its stance. Judging by the result, it seems that rehabilitation by motorcycle can work wonders.